The Arts Council of Windham County is conducting a Fine Art Raffle to benefit United Way's campaign to help victims of the Brooks House fire. Beginning on May 6, during Gallery Walk, and throughout May, tickets to win art created by three local artists will be sold at Vermont Artisan Designs (106 Main Street, Brattleboro). 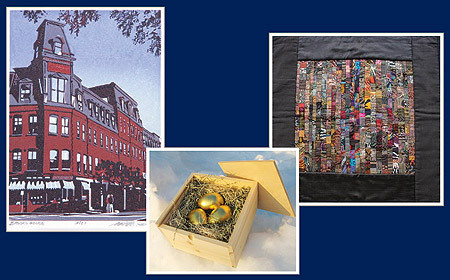 The three pieces of art are: (1) "All Your Eggs," a mixed-media sculpture by Vermont-based sculptor Andy Yoder; (2) "Brooks House," a 4-color, matted linoleum block print by Brattleboro artist William H. Hays; (3) a colorful, hand-stitched, 30x30-inch art quilt by Jan Norris of Delectable Mountain Fabrics. Raffle tickets are $5 each or six for $25. Since 1975, the Arts Council of Windham County has worked to strengthen the environment for artists and arts organizations in the region. For more information about ACWC or the Fine Art Raffle, visit the ACWC website: www.acwc.us.